Calling all Vail Valley gate bashers–registration is now open for the fifth annual Conway Cup community race, presented by Korbel. 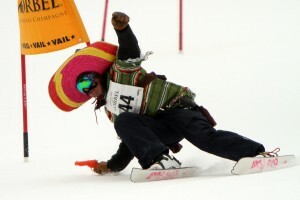 The race, open to competitors of all abilities, is scheduled for Wednesday, March 19, at Vail Mountain’s Golden Peak. Register to not only compete for some great prizes, including a spot in the Korbel Ford Cup during the Korbel American Ski Classic, but party like a rock star following the race in the Ski Classic tent. Costumes are encouraged and fun is definitely the name of the game. The annual Conway Cup is March 19 in Vail. Unlike previous years, racers in the 2014 Conway Cup will compete as individuals, rather than teams. The fastest four men and women will advance to the Finals, with the winning male and female skiers, along with two racers selected by random draw, moving on to the Korbel Ford Cup. Entries are priced at $25 per person. Registration includes entry in the Conway Cup race, presented by Korbel, two post-party invitations per racer for the shindig in the Ski Classic hospitality tent, Hawaiian-themed beach party, prizes for the racers with the most spirit and best costumes and more. Racers can register online at www.imathlete.com by entering Conway Cup. All racers must be 21-years-of-age and winning racers must be available to race both days of the Korbel Ford Cup, March 21-22. No substitutions will be permitted. Racing gets underway at 12:30 p.m. on March 19, with the Finals due to start at 3 p.m. Each racer will need to take two runs, one on each course, to determine the final field. The race is named and run in memory of Dan Conway, a great friend to ski racing at all levels throughout the Vail Valley, who passed away in May 2009. Through his position as Director of Racing for Vail and Vail Resorts, he played a key role in all competitions held on Vail and Beaver Creek Mountains, from World Cup and World Championships to NASTAR. The Conway Cup community race, presented by Korbel, is a project of the Vail Valley Foundation. For more information on the Conway Cup or the Foundation, visit www.vvf.org.